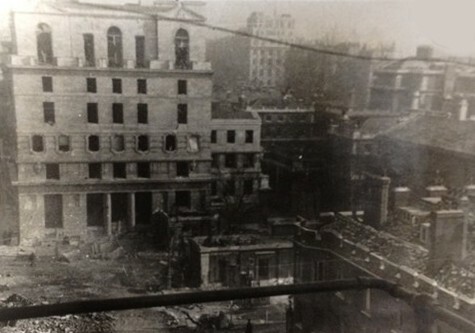 Pall Mall SW1, the avenue of London clubs running between Waterloo Place and St James's Street, was first damaged on 14 October 1940 when the Carlton Club was hit during an evening raid. 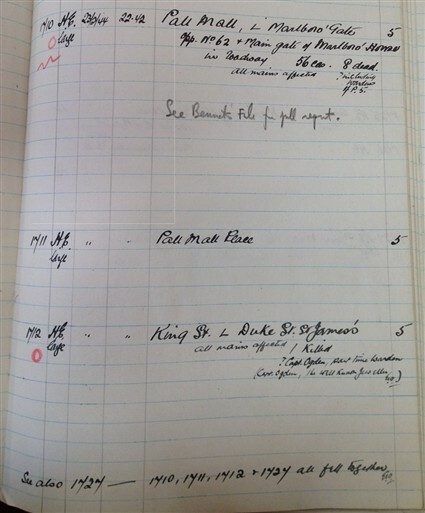 In November 1940 the area was struck again with damage caused to the Orleans Club, St James's Street, Duke Street, Waterloo Place (Cox & Co) and to St James's Park. 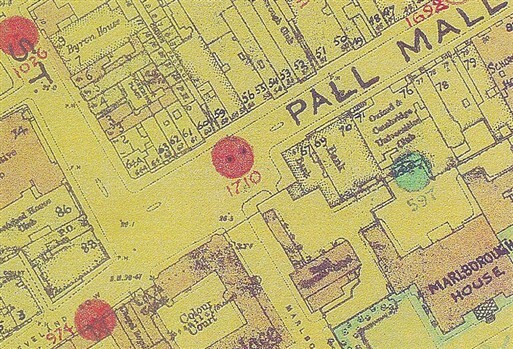 Pall Mall subsequently suffered incendiary damage late on 22 February 1944. 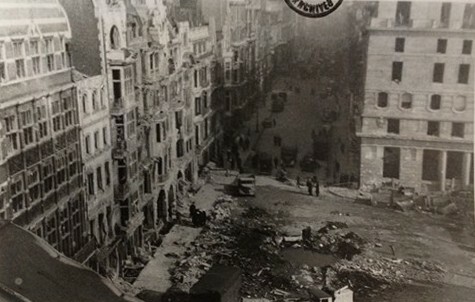 Then, the following night, 23 February 1944, four high explosive bombs hit the area between Jermyn Street and Pall Mall. Because they fell in a row, with overlapping blast radii, the blast damage from each bomb was greatly amplified. 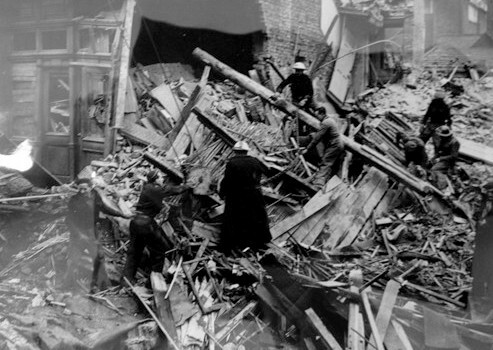 The first bomb fell on the roadway on Pall Mall, damaging a taxidermist's shop and local utilities. 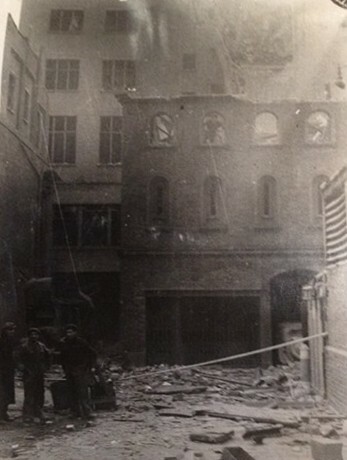 Another fell in the courtyard of Pall Mall Place, destroying houses in Rose and Crown Yard and several club buildings in the vincinty. The others hit the corner of Duke Street St James's and King Street and just behind the London Library. In addition to this major damage, the bombs also destroyed an ARP warden post, killing all of the patrolling wardens. This caused a delay in the responding time of emergency services, but soon the District and even the Chief Warden came down to the site to supervise its operation. In this incident, a total of 48 people were wounded, with 9 recorded deaths, including four wardens. 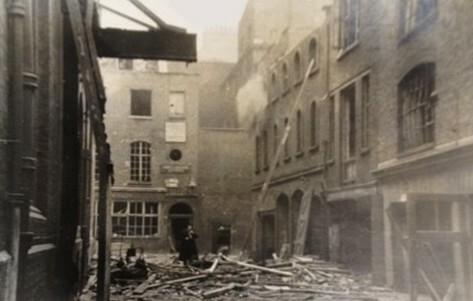 A concentrated area between King Street and Pall Mall was almost completely destroyed, with the bombs severing all gas and water mains in the vicinity of the blast, along with sparking several fires. 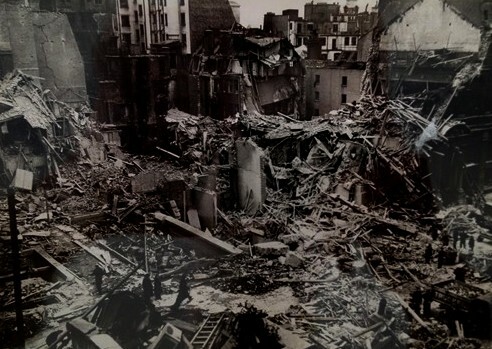 Damaged buildings included the Carlton Club on Pall Mall, which suffered light damage from the blast, the London Library (which lost many valuable records and books), the St James's Theatre, the Marlborough Club and the Orleans Club (the latter was completely destroyed). This was a wealthy neighbourhood and the bomb blasts scattered thousands of pounds worth of valuables including art and jewelry. There was some reported looting but after several weeks of salvage work, over half a million pounds worth of valuables were recovered from the site. 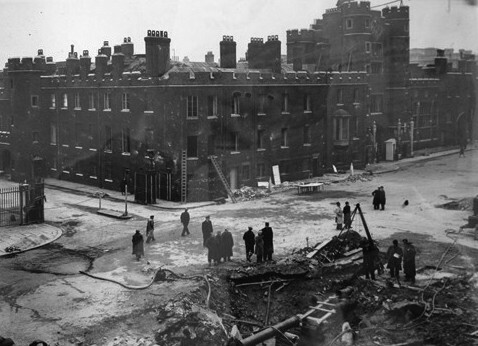 This was one of the the worst incidents the City of Westminster experienced during the so-called “Little Blitz” of 1944. This page was added by Joseph Torregrossa on 15/03/2012.